Indiscriminate use of antibiotics has led to the emergence of drug-resistant strains which have a significant impact on patient's morbidity and mortality. To date, there are many publications on studies performed both in vitro and in vivo on the therapeutic properties of manuka honey, and have confirmed its activity against a wide range of medically important bacteria. Honey is produced from many floral sources and its antimicrobial activity varies markedly with its origin and processing. ,, This variation can be due to difference in the enzymatic action and in the presence of additional antibacterial components derived from the floral source. As the potential role for honey as a topical agent to manage surgical site or wound infections is increasingly acknowledged  other honeys need to be assessed and evaluated. The present study was to evaluate the antimicrobial activity of honey native to India at various concentrations against Pseudomonas aeruginosa causing wound infection and its comparison with antibiotics and Dettol. A total of 50 strains of P. aeruginosa isolated from different types of wound infection including burns wound were used in the study. The isolation and identification of P. aeruginosa was done using standard methods. The antibiotic-sensitivity patterns of the isolates were studied by Kirby Bauer's disc diffusion method using commercially available antibiotic discs (Hi-Media labs, Mumbai India) gentamicin (10 μg), amikacin (30 μg), ceftazidime (30 μg), ciprofloxacin (5 μg), netillin (30 μg), cefotaxime (30 μg), piperacillin (100 μg), and imipenem (10 μg) as per the clinical and laboratory standards institute (CLSI) standards. Agmark grade honey (Dabur India, Capital overseas), a polyfloral honey with yellowish brown color, was used in the study. It had 100% purity and each 100 g of honey contains 80 g natural sugars, sodium 17 mg, potassium 138 mg, calcium 13 mg, iron 1.5 mg, and phosphorus 5 mg; sterilized by ultrafiltration and have the floral source from Himalayas, Nilgiris, and Sunderbans of India. The minimum active dilution of honey against P. aeruginosa isolates was determined by agar dilution methods. Double strength nutrient agar was used for the study, measured out into 10 ml aliquots and autoclaved. To prepare the plates it was melted and maintained at a temperature of 50 °C water-bath until poured. Solutions of the honey samples (at a concentration of 50% v/v) were prepared in sterile de-ionized water immediately prior to performing an assay. Appropriate concentrations of the stock and deionized water (total 10 ml) were dispensed aseptically into 10 ml sterile double strength nutrient agar before pouring into Petri dish More Detailses to produce a dilution series (5-25%) from concentrations required in a volume of 20 ml. The various agar honey mixtures were then poured into triplicate Petri dishes. 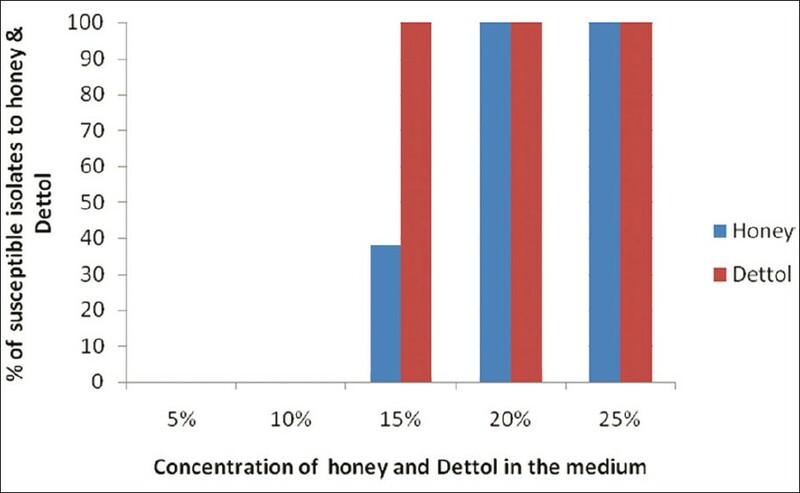 Antibacterial action of honey was compared with Dettol, (Reckitt Benckiser India Ltd, Capital Overseas) at a concentration similar to honey which contains an aromatic chemical compound chloroxylenol (C 8 H 9 ClO) (4.8% of the total Dettol mixture), which is the key ingredient exhibiting unique antiseptic property. Subcultures of the P. aeruginosa isolates were grown overnight in 10 ml peptone water. The turbidity was adjusted to 0.5 Mc Farland and 10 μl of culture was spot inoculated on to the surface of the medium. The plates were incubated at 37°C for 24 h before visual assessment of the growth. The tests were performed in triplicates. Control plates of plain nutrient agar were included in each susceptibility assay to confirm the viability and density of the cultures. P. aeruginosa american type culture collection (ATCC) strain 27853 was inoculated on each plate for comparison. The bactericidal effect of honey was studied by time kill assay. Honey was used undiluted and at different dilutions. With each experiment saline control of the organism was also used. Two milliliters each of undiluted and different dilutions of the honey were taken in sterile test tubes and inoculated with 20 μl of broth culture of the test bacterium in an initial concentration of approximately 5×10 5 CFU/ml. All the tubes were incubated at 37°C and the viable count of bacteria in each tube was determined at an interval of 4 h up to 24 h by the surface plate method. Viable count of bacteria in both test and control tubes at each time interval was noted by performing plate culture on nutrient agar without honey. A total of 50 strains of P. aeruginosa isolated from infected wounds were studied over a period of 2 years. 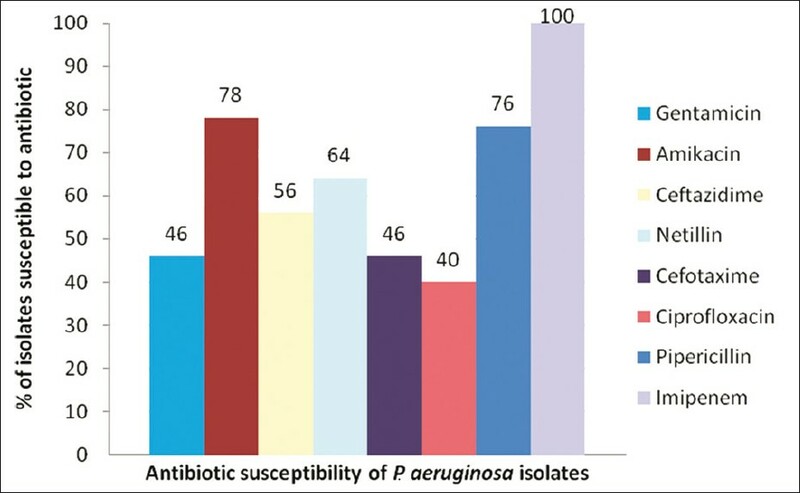 The antibiotic susceptibility patterns of the P. aeruginosa isolates are shown in [Figure 1], where the y axis indicates the percentage of the isolates susceptible to various antibiotics plotted on the X axis. Multidrug resistance was a common feature among most of these isolates 41 (82%) and the remaining 9 (18%) isolates were pan sensitive. Among the antibiotics tested against P. aeruginosa isolates in this study imipenem 50 (100%) being highly effective followed by piperacillin 39 (78%), amikacin 38 (76%) netillin 32 (64%), ceftazidime 28 (56%), gentamicin 23 (46%), cefotaxime 23 (46%), and ciprofloxacin 20 (40%), respectively. The effects of honey on all the isolates of P. aeruginosa were studied by the determination of minimum inhibitory concentration (MIC), indicating the highest dilution of honey in the culture medium which inhibits the growth of P. aeruginosa isolates. The MIC of all the 50 strains (100%) to honey was found to be 20%, of which 19 strains (38%) were having an MIC of 15% including the standard strain of P. aeruginosa ATCC 27853. Honey concentrations ranging from 5% to 10% were found to be ineffective as shown in [Figure 2]. The Y axis indicates the number susceptible percentage of isolates to honey and Dettol at various concentrations (5-25%) plotted on the X axis. The time kill assay for the bactericidal effect was tested on five isolates of P. aeruginosa so as to understand the time required to kill the bacterial population irrespective of their antibiotic susceptibility patterns as isolates varying in their susceptibility pattern were used. Honey at concentrations of 20%, 25%, 50% could bring out complete destruction in 24 h, whereas concentration of honey at 75% and 100% could bring about complete destruction of P. aeruginosa in 12 h [Table 1]. The lowest concentration of the honey which showed bactericidal activity was at 20% for all the five isolates tested in time kill assay. The antibacterial activity of honey was concentration dependent for all the 50 isolates tested at a concentration below 20% using agar dilution methods [Figure 2]. The antibacterial effect of 50% honey on P. aeruginosa with number of hours and percentage of survival rate was calculated. The average percentages of survival rate for five P. aeruginosa isolates after 4 h, 8 h, 12 h, and 24 h were found to be 22.3, 5.2, 1.1, and 0 respectively as shown in [Table 2]. The present study shows the bactericidal activity of honey against P. aeruginosa strains. As honey is considered as a natural antiseptic in the management of wound infections, its efficacy was compared with Dettol. It was observed that these organisms were more or less susceptible to honey and Dettol at 20% and 10% irrespective to their antibiotic sensitivity patterns. Dettol antiseptic liquid contains chloroxylenol which is proved to kill a wide variety of microbes and is widely used for cleansing wound. The antibacterial action is due to disruption of the cell membrane potentials and blocking the production of adenosine triphosphate. The antibacterial effect of honey was concentration dependent and bactericidal effect was observed at concentration of 20% or more for P. aeruginosa isolates tested. Since P. aeruginosa are recalcitrant to antibiotic therapy the ability to inhibit test isolates irrespective of their antibiotic sensitivity patterns has important clinical applications. This property may make honey useful in the treatment of drug-resistant infections. The mechanisms of antibacterial action of honey remain speculative. Honey may inhibit bacterial growth due to a number of different mechanisms. High sugar concentration, low pH, hydrogen peroxide generation, proteinaceous compounds, or other unidentified components present in the honey may all provide antimicrobial activity. Shrinkage and disruption of the bacteria may be due to its osmotic effect, low pH, and also due to the presence of antibacterial substance such as inhibine. , Several components may contribute to the non-peroxide activities of honey, such as the presence of methyl syringate and methylglyoxal, which have been extensively studied in Leptospermum honeys. Besides its antimicrobial properties, honey can clear infection in a number of ways in vivo, like boosting the immune system, anti-inflammatory, and antioxidant activities and via stimulation of cell growth. After reviewing the literature it has been found that apart from Mulai et al.,  no other Indian study has been carried out exclusively on antibacterial activity of honey against P. aeruginosa in vitro. As there is lack of scientific research and documentation, still the medicinal properties of Indian honeys remain in the dark. Further studies on human subjects are required in vivo to understand the efficacy of Indian honeys in eliminating bacteria from wounds. As this study presents the findings of in vitro antibacterial activity of honey against planktonic bacteria this should not be related to chronic wound environment where indeed biofilms of P. aeruginosa may be present and the characteristic of bacteria can change; hence, future studies in this direction will pave the way in establishing the medicinal importance of Indian honey against the sessile forms of P. aeruginosa. As honey is easily available in the market and is inexpensive its antibacterial activity was comparable to other medicinal honeys. All strains of P. aeruginosa including both resistant phenotypes and sensitive strains were inhibited at 20% antibacterial honey concentrations in vitro. This intriguing observation may have important clinical implications and could lead to a new approach for treating multidrug resistant P. aeruginosa infected wounds using honey of Indian origin. 1. Hamid S, Saeed MA. Bee keeping. Hamdard Med 1991;34:94-5. 2. Deshpande SD, Kulkarni KS. In vitro effect of some India honeys on Staphylococcus aureus from wounds. Indian J Exp Biol 2010;48:931-5. 3. Cooper RA, Molan PC, Harding KG. Antibacterial activity of honey against strains of Staphylococcus aureus infected wounds. J R Soc Med 1999;92:283-5. 4. Molan PC, Cooper RA. Honey and sugar as a dressing for wound and ulcers. Trop Doct 2000;30:249-50. 5. Cooper RA, Molan PC. Honey in wound care. J Wound Care 1999;8:340. 6. Subramanyam M. Topical application of honey in the treatment of burns. Br J Surg 1991;78:497-8. 7. Bhatia R, Narain JP. The growing challenge of antimicrobial resistance in the South-East Asia Region-are we losing the battle? Indian J Med Res 2010;132:482-6. 8. Molan PC. The role of honey in the management of wounds. J Wound Care 1999;8:415-8. 9. Cooper RA, Halas E, Molan PC. Efficacy of honey in inhibiting strains of Pseudomonas aeruginosa form infected burns wound. J Burn Care Rehabil 2002;23:366-70. 10. Cooper RA, Molan PC. The use of honey as an antiseptic in managing Pseudomonas infection. J Wound Care 1999;8:161-16 4. 11. Willix DJ, Molan PC, Harfoot CG. A comparison of the sensitivity of wound infecting species of bacteria to the antibacterial activity of manuka honey and other honey. J Appl Bacteriol 1992;73:388-94. 12. Irish J, Blair S, Carter DA. The antibacterial activity of honey derived from Australian flora. PLoS One 2011;6:e18229. 13. Gethin G, Cowman S. Bacteriological changes in sloughy venous leg ulcers treated with manuka honey or hydrogel: An RCT. J Wound Care 2008;17:241-4, 246-7. 14. Baron EJ, Peterson LR, Sydney MF. Non ferementative gram negative Bacilli and coccobacilli. Bailey's and Scott's diagnostic microbiology. 9 th ed. St Louis:mosby-Year Book: 1994; pp397. 15. Gopalkrishna BK. Effect of honey on bacteria isolated from burn wound infection: An in vitro study. Biomed 1998;18:68-72. 16. Brown R, Poxton IR. Centrifuges, colorimeters and bacterial counts. In: Collee JG, Marmion BP, Fraser AG, Simmons A, editors. Mackie and Mc Cartney Practical Medical Microbiology. 14 th ed. New york: Churchill Livingstone; 1996. p. 845. 17. Aly R, Maibach HI. Comparative antibacterial efficacy of a 2-minute surgical scrub with chlorhexidine gluconate, povidone-iodine, and chloroxylenol sponge-brushes. Am J Infect Control 1988;16:173-7. 19. Lusby PE, Coombes AL, Wilkinson JM. Bactericidal activity of different honeys against pathogenic bacteria. Arch Med Res 2005;36:464-7. 20. Basson NJ, Grobler SR. Antimicrobial activity of two South African honeys produced from indigenous Leucospermum cordifolium and Erica species on selected micro-organisms. BMC Complement Altern Med 2008;8:41. 21. Orla S, Anthony D, Rahma A, Alice P, Georgina G, Seamus C, et al. Comparison of the antimicrobial activity of Ulmo honey from Chile and Manuka honey against methicillin-resistant Staphylococcus aureus, Escherichia coli and Pseudomonas aeruginosa. BMC Complement and Altern Med 2010;10:47. 22. Wilkinson JM, Cavanagh HM. Antibacterial activity of 13 honeys against Escherichia coli and Pseudomonas aeruginosa. J Med Food 2005;8:100-3. 23. Greenwood D. Honey for superficial wounds and ulcers. Lancet 1993;341:90-91. 24. Chiriife J, Searmato G, Herszage L. Scientific basis for use of granulated sugar in treatment of infected wounds. Lancet 1982;1:560-1. 25. Blomfield R. Honey for decubitus ulcers. JAMA 1973;224:905. 26. Subramanyam S. Storage of skin grafts in honey. Lancet 1993;341:63-4. 27. Zeina B, Zohra BI, Al-assad S. The effects of honey on leishmania parasites: An in vitro study. Trop Doct 1997;27 Suppl 1:36-8. 28. Mundo MA, Padilla-Zakour OI, Worobo RW. Growth inhibition of foodborne pathogens and food spoilage organisms by select raw honeys. Int J Food Microbiol 2004;97:1-8. 29. White JW Jr, Subers MM, Scheparts AI. The identification of inhibine, the antibacterial factor in honey as hydrogen peroxidase and its origin in a honey glucose oxidase system. Biochim Biophys Acta 1963;73:57-70. 30. Zumla A, Lulaf A. Honey-a remedy rediscovered. J R Soc Med 1989;82:384-5. 31. Mavric E, Wittmann S, Barth G, Henle T. Identification and quantification of methylglyoxal as the dominant antibacterial constituent of manuka (Leptospermum scoparium) honeys from New Zealand. Mol Nutr Foods Res 2008;52:483-9. 32. Al-Jabri AA. Honey, milk and antibiotics. Afr J Biotechnol 2005;4:1580-7. 33. Mullai V, Menon T. Antibacterial activity of honey against Pseudomonas aeruginosa. Indian J Pharmacol 2005;37:403.